It’s finally here! 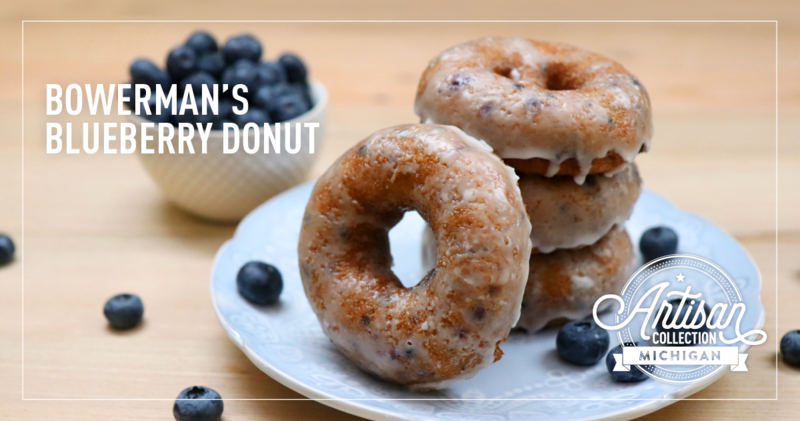 We are excited to roll out Bowerman’s Blueberry Donut, the first flavor in our Michigan Artisan Collection! This small batch flavor pairs our traditional vanilla ice cream with a Michigan blueberry swirl and chunks of blueberry donut straight from Bowerman Blueberry Farm in Holland, Michigan. While Michigan may be well-known for its cherry production, it also stands among the top producers for blueberries with 100 million pounds of blueberries produced every year — from Lake Michigan to Lake Huron and into the Upper Peninsula. We wanted to create more than a blueberry ice cream, and that’s where our partner for this flavor, Bowerman Blueberries, comes into the picture. Bowerman Blueberries makes a famous blueberry donut, baked fresh each day and sold in their farm market. This donut is well-known and loved by visitors to Bowerman Blueberries, which has a long history of growing berries – this family owned and operated farm was first established in 1954. Given how popular this blueberry donut is, we are sure this flavor will hit home with all Michiganders! As part of the Michigan Artisan Collection, Bowerman’s Blueberry Donut is the first of three artisan flavors that will be available this year! Inspired by our great home state, these flavors feature locally-sourced ingredients from culinary artisans, including Michigan farmers, bakers and chocolatiers. To capture the best flavors from Michigan, we are collaborating with local artisans who share our passion for crafting outstanding flavors that associated with the state. You can get the first taste of Bowerman’s Blueberry Donut by joining us to celebrate Detroit’s 317th birthday at Cadillac Square on July 24, where we’ll be serving free scoops of this new flavor, plus other Hudsonville Ice Cream fan favorites. Visit our Facebook event page for more information. Starting the week of July 30, you can grab a scoop of the Bowerman’s Blueberry Donut for a very limited time at any of the following select scoop shops. Move fast, this flavor won’t last long! We can’t wait for you to try this great flavor that combines two Michigan classics!